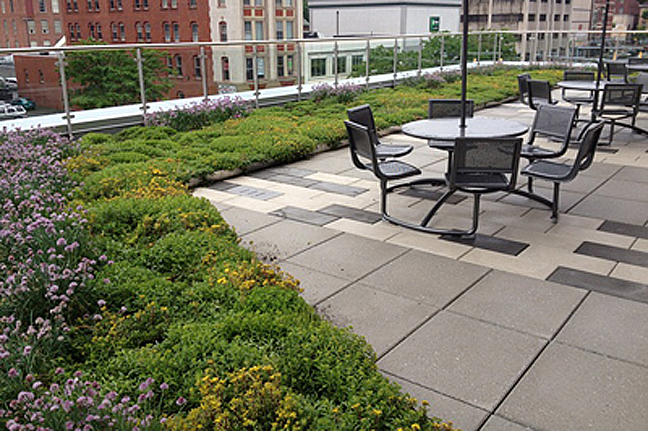 An attractive amenity space was created for a Connecticut police station featuring the GreenGrid green roof system, furnished and maintained by Weston. As part of a new facility designed in consultation with the chief of police, a GreenGrid system was selected by the architect to create a comfortable amenity space adjacent to break and training rooms. As a pre-grown modular system, it quickly installed atop the hardscape, allowing for simple future maintenance and an instant space for officers to relax and enjoy time outdoors without needing to leave the facility. Weston provided cost-effective ongoing maintenance services to ensure this terrace remained in top condition without distracting the department from their primary duties.